_Designed in partnership with Mary Jones. 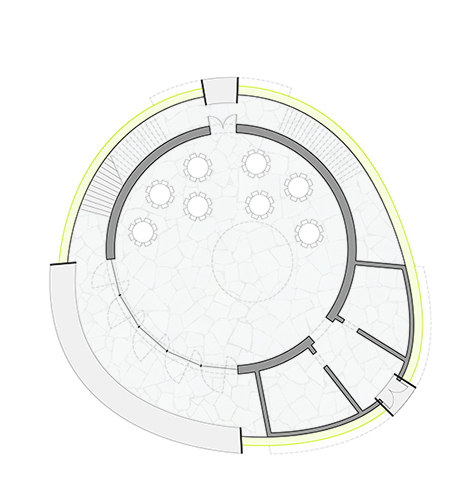 Our proposal is a layered approach, beginning with a simple red drum-shaped hall. This hall has an uninterrupted circular plan and will easily accommodate a multitude of activities, from weddings, to classes, to board meetings. We have placed the auxiliary storage, restroom, and prep functions outside of this pure volume, so as to not interfere with the form’s simple beauty. A large skylight will bring in ample daylight and exposed wood structure will add a tactile quality. A large glass wall will seamlessly connect the interior space with the Commons of the Homestead Garden and allow views to the Boxwood House beyond. The feeling will be at once both expansive and warm. A generous stair winds around the drum, connecting the inner drum to an outer skin. This exterior stair would have a large landing at the halfway point with an operable glass wall that would give the users a view of activities within the drum. From there the stair would ascend to the Lookout where one would be greeted with a panoramic view of the lake, the garden, and downtown. 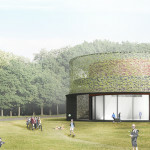 The conditioned drum is wrapped in an exterior planted skin, becoming an experimental vertical garden. Its structure would be a steel and mesh framework on which vines would be encouraged to grow. It would have a level of transparency, created by natural vine growth and deliberate architectural punctures, that would allow glimpses of the red drum within. Different types of flowering vines would be allowed to take over its surface thus providing an ever- changing facade. The Planted Barn completely accommodates the programmatic goals of the building and takes full advantage of the site on which it is “planted”.